Unless you have been sleeping under a rock in a cave, on a different planet, chances are you have noticed or heard about the recent rise in online gambling. 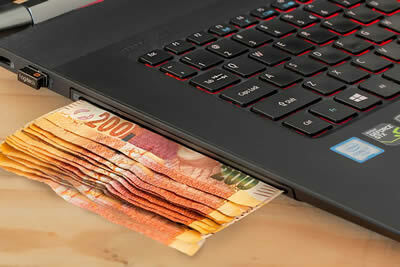 Pretty much everything you can imagine is now moving to the online space, and gambling being such a lucrative industry, you can bet that bringing that industry to the world wide web has made a powerful impact on the economy. Whether it is gambling tips, online casinos, or online poker, the gambling community has grown considerably over the last few years as entrepreneurs, investors, and professional gamblers alike scramble into the online space hoping to capitalize on the billions of dollars of revenue floating around the internet. One of the reasons that gambling has had such a profound impact on the economy is because there are a lot of great gambling specials online, which especially encourage newcomers to try their hand at it. The internet has over 2 billion users, and it is growing like wildfire every day. That also means there is a whole new generation of people flocking to the market. So it is very appealing for investors to try to capitalize on so much new potential revenue. Long-time high rollers love this move to the internet as well. That is because it means a whole new batch of inexperienced gamblers that breathe new life into the gambling scene. It is projected that the gambling scene will grow substantially over the next ten years, and you can bet there are plenty of finance gurus moving in to make their plays. Gambling has become a staple of many communities all over the world. New Zealand’s economy for instance has experienced a huge boost in revenue for the communities thanks to the new gambling sensation. In 2016 alone, online gambling brought in a record 40 billion dollars. Even more interesting, over 40% of that revenue came from young gamblers between the age of 21 and 34. The stats have shown that there are lots of younger players wanting to get in on the action, but they prefer to play online rather than make big trips to expensive brick and mortar casinos. Another advantage of the online gambling community is that countries where there are no casinos or regulations are strict, members of that country can still play the games they like online. The online gambling community is pumping revenue into a lot of places that would likely be floundering otherwise. The impact that gambling has had on the economy is clear at this point, and it seems to be for the better. Online casinos don’t have the same money restrictions or rules that in-house casinos do. Also online communities can be reached from anywhere. People are no longer limited to what games they can play based on where they live. This has provided a kind of economic and social freedom that makes the appeal easy to see.